*Free with a Eventbrite RSVP. Choose from a menu of self-guided outdoor adventures (appropriate for ages 7 to adult) that invite you to discover hidden special places in the park. From challenging quests and geocaching to Explorer Backpacks and scavenger hunts, park staff will welcome and orient you on your adventure of choice. Geocaching (all ages): Use a smartphone to locate hidden boxes in unique spots and stories around the park. Special prizes will be located in Presidio geocache boxes on this day. 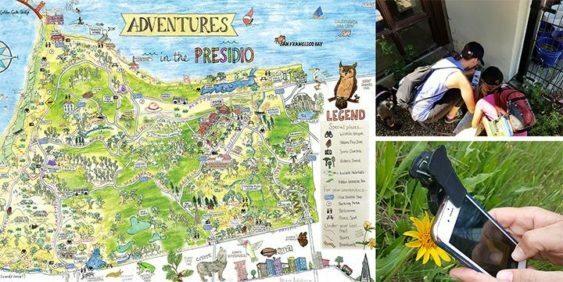 Presidio Explorer Backpack (ages 7 and up): The Presidio Explorer Backpack is like a board game come to life. It contains an adventure map and cards that guide you to fun discoveries – wildflowers, creatures, and more – on a meandering route of your choosing. Petlenuc Creek Quest Adventure: A sense of place treasure hunt for youth (ages 8-12) and families that offer a fun, team approach to exploring the Tennessee Hollow Watershed. Tennessee Hollow Watershed Walking Guide (ages 13 and up): Find your way to the key spots in the midst of an ecological renaissance.